Store embedding media in Polyethylene Syringes (body, plunger and tip) in the deep freeze ready for quick use; dispenses easily and cleanly into capsules. Supplied with a cap for the tip. Tip lengths on all syringes are 28.6mm (1-1/8"); Tip inside diameters for #115-30 and #115-40 at opening are 1.6mm (1/16"). Tip inside diameter for #115-60 at opening is 10.4mm (0.41"). Ungraduated. 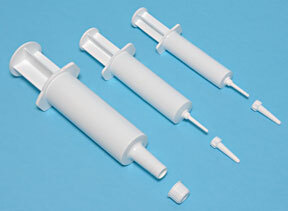 These polyethylene syringes are completely silicone free. 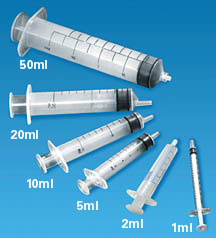 Clear plastic, graduated syringes with sizes from 1ml to 60ml. Body and plunger are made from polypropylene, seal on plunger is made from polyisoprene (rubber) except for #115-51 which has an all plastic plunger. Sterile. Wall Types, regular (top); thin (bottom). Note: The needles below are of the Luer Slip type. They slip over the syringe tip, as opposed to Luer Lock needles that screw into the mouth of the syringe. Product No. 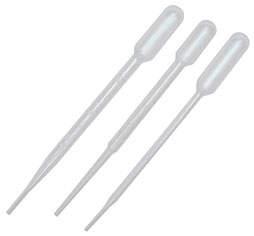 115-55 syringe requires a Luer Lock style needle which we do not sell.